Hit your stride at Sheraton Oklahoma City Downtown Hotel, a contemporary destination situated in the heart of OKC's most dynamic neighborhood. Steps from Bricktown's wealth of dining and entertainment opportunities, our hotel taps into the pulse of Oklahoma City, placing guests in the center of it all. 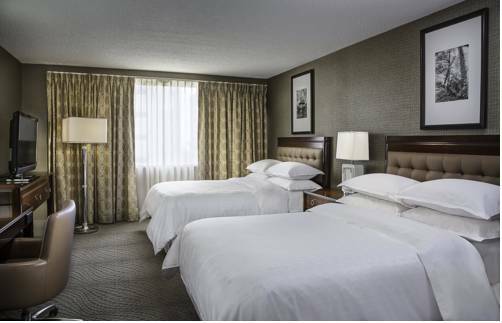 Thoughtfully appointed guest rooms and suites provide an inspiring backdrop to work and play; Chesapeake Energy Arena is moments away, plus we offer a direct connection to the Cox Convention Center. However you elect to spend your time in the city, make use of our ample amenities, including a well-equipped fitness center, a spacious outdoor pool and several dining destinations. Block 23 showcases modern American cuisine served in an exuberant setting, while Aria Lounge presents elevated bar food and craft cocktails. With over 20,000 square feet of flexible venue space, our hotel is also an enlightened choice for conferences at Cox Convention Center or other special events in downtown OKC. Block 23: Block 23, our signature restaurant, presents innovative fare served with a side of modern Southern charm. Lead by Chef Steve Hall, this downtown destination features a spacious patio, perfect for dining al fresco in OKC. Aria Lounge: Unwind after a busy day exploring Oklahoma City at Aria Lounge, our sophisticated bar and lounge. Sip on a craft cocktail while nibbling on a specialty burger, signature starter or inventive salad. Library Coffee & Co: Fuel up at Library Coffee & Co before exploring downtown OKC. Showcasing freshly brewed coffee and light bites, this casual caf is the perfect place to begin your morning in Oklahoma City.